Innovation combines with science and technology to create new products and applications. Let us guide you through that process and help you create the critical technologies that give your company and products a competitive edge. We believe in using the best software in the industry. FRED Optical Engineering Software is an essential tool we use to analyze and simulate your design and packaging models to assure radiometrically accurate performance. You have an idea that requires a special lens to be made. You are particularly interested in cost versus quality factors. You know that it is extremely important to get lenses that will work while achieving the best value. This means getting a reasonably low cost but with consistent quality and delivery. Your company has no dedicated optical professional. Where should you go? by Optical Systems Design, Inc. Many companies can realize your lens. Some of these optical lens vendors offer vertical integration (or turn-key) services. They can take your design specifications, commit the design, review its EXPECTED performance, build, and test the lens. Other fabrication houses may claim that they can do this too, but beware the vendors who keep a designer as a consultant. The potential for poorly applied specifications increases with the number, and separation, of the parties involved. I know many optic and lens vendors that support full-time designers who are very good. Other vendors may have in-house design as well. Beware the vendor that claims to have an optical design program and can do it himself. but aren't there other choices? Your best approach is to identify a good designer. Many very good independent designers are available that can lead you through this entire process and represent your needs and specifications to the vendors. Also there are very good (and usually much more expensive) design houses that can do the same. These include Optical Research Associates in Pasadena and Optics 1, Inc. in Westlake Village, CA. These houses have several designers and can identify the one who might most closely match (in experience) your technology flavor (reflective versus refractive, centered versus noncentered, spherical versus aspherical and perhaps diffractive optical elements). Why would you want to bring a third party to the project? The advantage of using a professional designer-consultant results from separating the design, that you will control, from the vendors, that will competitively bid for your work. A turnkey vendor gives less control over the design process (they will favor what they are comfortable with and lead you there) and will be less competitive since they will practically own the fabrication contract at the outset. Their design will favor their tooling and process giving them an advantage even if the design is bid elsewhere. What can you expect from your consultant? 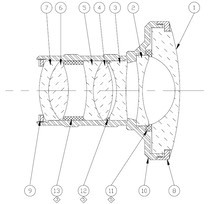 A good design consultant will design the lens system to your requirements and then produce a model of the optical system to ensure that the design meets a system level performance goal with some margin (i.e.. the spot will be smaller or the wavefront flatter for the design than required in the lab or instrument). No lens design can be truly perfect. Its deviations from ideal are usually called design residuals. No optical surface or bulk lens can be generated that gives a perfect or ideal lens shape that the design specifies. These errors diminish performance and are called fabrication residuals. No set of lenses or optics can be perfectly aligned. These errors also diminish performance and are called alignment or integration residuals. The design should provide not only the lens prescription, but the fabrication and alignment tolerances that provide some level of (statistical) confidence that the finished lens will perform within specifications. Generally, tighter (smaller) tolerances cost more money to make as they represent more time, more experience and potentially less yield. The tolerance analysis gives some insight into the cost versus performance trade off. Code V (from ORA) calculates the expected performance of the lens using statistical analyses and they (ORA) call this the "As Built" performance. Your designer should convey and justify some confidence that the as-built lens will satisfy your requirements. Further, the designer must completely document the required optical system to extent necessary for vendors to interpret the design prescription as well as the fabrication and alignment tolerances. What can you do with your design data package? The unconstrained design can then be used for obtaining vendor quotes. Note that the design software will chose surface radii from the set of real numbers. Most vendors have tooling for a discrete set of radii. The quotation should be made with the assumption that the design will be "fitted" to the chosen vendor tooling. This saves lots of money as most all vendors will be happy to buy or make new tooling and charge you for it. The tooling fit can be done manually or some software can do it automatically. I prefer manual fits since they provide better control, but take only a little longer. Here a radius is chosen from the tooling set that very closely matches a radius in the design (usually a short radius or very sensitive surface) and then the lens design program re-adjusts the other radii to give the best performance. If this performance is adequate (with some margin) then the fitted radius is frozen and another radius is fit. This continues until all are fit to the vendor. Occasionally, not all of the radii can be fit. So it is a good idea to ask the vendor to quote their tooling costs before choosing one. What can you expect from you fabrication vendor? The chosen vendor should be able to fabricate, integrate and test the finished lens assembly. Some vendors may quote only finished optical elements and tell you that you can complete the assembly. They may also request that you take responsibility for the design of the lens housing or barrel and if your consultant offers to design it, you should be very cautious and thoroughly assess his credentials. If the housing is poorly designed and toleranced, it may not support the optics with adequate precision to meet the optical design requirements. If the lens elements are not fabricated to their tolerance requirements, the as-built lens may not perform to your expectation. The problem then becomes identifying where the inadequacies lie. The "not invented here" litany will be heard from the optical vendor, the housing vendor, and perhaps, even your consultant. The most prudent approach gives the fabrication, assembly, and test of the lens to the vendor who will supply finished pieces with some level of certification. These vendors will have invested in expensive metrology that gives them quality assurance and management that you will probably not want to duplicate. Further, they will have vendors for mechanical housings with which they have experience and good pricing terms established as they must compete for your business. The assembly of optical systems is an exacting trade and requires experience that is hard to find (and hire). So leave these to the vendor. After all, it's their line of business and they are good at it. Another thing to note, I have found that it is generally better to ask the vendor to take responsibility of the mechanical design of the lens housing. As with all aspects of technology, there is always more than one way to make and then mount a lens. Some vendors have different approaches to constraining the lens that depend on their processes and tooling. By allowing the vendor to choose and work with the opto-mechanical engineer, you will probably have better success and yield. Just make sure that you get control drawings and final approval before production starts. Optical professionals represent your interests in this specialized discipline. As I mentioned, a good design consultant can lead you through this process and bring you to a good lens while monitoring your costs. This approach is somewhat like hiring a good architect before having various contractors build your dreamhouse. This can save you money only if you hire a good professional. I have worked through technology development like this from both sides. As the scientist specifying the lens system and as the design professional leading a client through the entire process. If you want further information, please post a message or use the Contact Form.